“An Overview of Secondary Aquifers in Nebraska” was produced by the Conservation and Survey Division, a multidisciplinary research, service and data-collection organization established by Nebraska state statute in 1921. Nebraska's underlying geological formations store more groundwater than any other state, and in western Nebraska groundwater is used for irrigation, livestock, municipal water systems, rural homes and other uses. Most groundwater users in western Nebraska can tap into the two largest most extensively used aquifers in Nebraska, known as primary aquifers. These include the High Plains Aquifer (sometimes called the Ogallala Aquifer) and the shallow sand and gravel layers common across the state. But those two primary aquifers don't exist or aren't usable everywhere. So some groundwater users must tap into secondary aquifers. Now, a first-ever comprehensive summary of the location and characteristics of the seven secondary aquifers in Nebraska has been published. 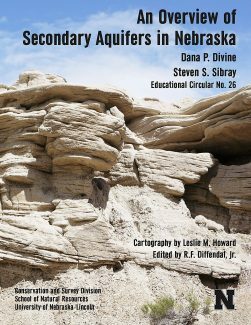 "An Overview of Secondary Aquifers in Nebraska" was produced by the Conservation and Survey Division, a multidisciplinary research, service and data-collection organization established by Nebraska state statute in 1921. The division also serves as the natural resource survey component of the University of Nebraska Lincoln's School of Natural Resources. Co-authors are Conservation and Survey hydrogeologists Steve Sibray, based at the UNL Panhandle Research and Extension Center in Scottsbluff, and Dana Divine, based in Lincoln. Divine, Sibray and cartographer Les Howard complied and analyzed data, wrote text, and created maps that show the location of more than 4,000 active wells spread across 30 counties in eastern and western Nebraska. "The purpose of this publication is to inform people that many Nebraskans use aquifers other than the well-known High Plains aquifer, and to answer questions commonly asked about these aquifers," Divine said. The secondary aquifers discussed include the Chadron, Brule, and Upper Cretaceous aquifers in western Nebraska and the Western Interior Plains, Dakota, Codell, and Niobrara aquifers in eastern Nebraska. "More than one secondary aquifer is used in some counties," Divine said. "The maps in this publication are printed on transparent overlays so that the spatial relationship of the aquifers to each other is clear." In addition to the locations of the aquifers, the following questions were answered: How extensively is the aquifer used? What are the average well depth, depth to water, and yield? Where are the recharge and discharge areas? What is the water quality? What are potential problems associated with using the aquifer? What do cuttings from the strata hosting the aquifer look like? "People should find this publication helpful if they have concerns about their water quality or if they want to know if they have potential to install a well in an area where the High Plains aquifer is absent. They should get a good idea of how deep these aquifers are and what to expect in terms of well yield and water quality," Sibray said. Hard copies of the publication are $24.99 each from Nebraska Maps and More Store on the first floor of Hardin Hall, 33rd and Holdrege streets (or online at https://marketplace.unl.edu/nemaps/ ; look under the "educational circulars" category); or by phone at (402) 472-3471. A free pdf is available online at digitalcommons.unl.edu. Sibray said the publication has been in the works for about a year. But it incorporates research and data from many years of work by Conservation and Survey. It also includes much data from the Nebraska Department of Natural Resources. When well drillers register new wells with DNR, they also file logs describing the geology. The publication is dedicated to Nebraska's well drillers, "whose work has provided many geologic samples from the secondary aquifers, and whose sample descriptions provide the basis for this publication." The publication focuses on eastern and western parts of Nebraska, but not the center, because in central Nebraska the High Plains Aquifer is the overwhelming source of groundwater, and there is little to no need to tap into secondary aquifers, Sibray said. Some geologic formations are continuous across Nebraska, but are not an important source of water everywhere in the state. The western aquifers include the Chadron, Brule, and Upper Cretaceous formations. These are older, deeper geologic formations, according to Sibray, and can have problems with water quality. They lie underneath the primary aquifers and exist in areas where primary aquifers are not present. The oldest, and deepest, of these is the Cretaceous, which is hosted by all or part of three geologic formations, Lance, Fox Hills Sandstone, and the upper Pierre Shale. In Nebraska, these three geologic formations are present only in the southwest part of the Panhandle. Only 11 active wells and one inactive well have been identified in the Upper Cretaceous aquifer in Nebraska, all uses for livestock or domestic purposes. All of them except one are in extreme western Kimball and Scotts Bluff counties. The other one is in Banner County. Water quality in the Upper Cretaceous is poor, with tests showing high concentrations of sodium and possibly chloride. The next oldest is the Chadron Aquifer. It is developed primarily in the Panhandle, but might be a minor source of water in parts of surrounding states. There are about 163 active registered wells screened entirely in the Chadron. Most of them are used for domestic and livestock purposes, although some are used for irrigation. In the Scottsbluff area, a number of rural homes north of the city tap into the Chadron for drinking water. Another 50 or so wells are screened to draw water from both the Chadron and High Plains aquifers. These are mostly in the southwestern part of the state. Water quality from the Chadron aquifer is generally poor, with high concentrations of total dissolved solids and sodium, but other water quality aspects vary from one place to another. A portion of the Chadron is mined for uranium in the Crawford area. In addition to water quality, the publication says that potential problems include declining hydraulic head and flow rates where the aquifer is used for irrigation, since it is a confined aquifer. The publication said use of the Chadron aquifer for human consumption should be monitored because of elevated uranium and arsenic concentrations. The third secondary aquifer in western Nebraska, also the shallowest and youngest geologic formation, is the Brule Sand-Sandstone Aquifer. The Brule is present in parts of the Panhandle. Of the wells that tap into the Brule, about half are for private domestic use, one-third for livestock, and the remainder for irrigation and monitoring purposes. Water quality in the Brule is generally good, but one potential problem is large drawdowns where irrigation wells have been drilled into ancient paleovalleys that are small and hydraulically confined.